Home Jesus The True Easter Story What Final Words And Admonitions Did Jesus Have For His Followers? What Final Words And Admonitions Did Jesus Have For His Followers? 180:0.2 "You well remember when I sent you forth without purse or wallet and even advised that you take with you no extra clothes. And you will all recall that you lacked nothing. But now have you come upon troublous times. No longer can you depend upon the good will of the multitudes. Henceforth, he who has a purse, let him take it with him. When you go out into the world to proclaim this gospel, make such provision for your support as seems best. I have come to bring peace, but it will not appear for a time. 180:0.3 "The time has now come for the Son of Man to be glorified, and the Father shall be glorified in me. My friends, I am to be with you only a little longer. Soon you will seek for me, but you will not find me, for I am going to a place to which you cannot, at this time, come. But when you have finished your work on earth as I have now finished mine, you shall then come to me even as I now prepare to go to my Father. In just a short time I am going to leave you, you will see me no more on earth, but you shall all see me in the age to come when you ascend to the kingdom which my Father has given to me." 180:1.1 After a few moments of informal conversation, Jesus stood up and said: "When I enacted for you a parable indicating how you should be willing to serve one another, I said that I desired to give you a new commandment; and I would do this now as I am about to leave you. You well know the commandment which directs that you love one another; that you love your neighbor even as yourself. But I am not wholly satisfied with even that sincere devotion on the part of my children. I would have you perform still greater acts of love in the kingdom of the believing brotherhood. And so I give you this new commandment: That you love one another even as I have loved you. And by this will all men know that you are my disciples if you thus love one another. 180:1.2 "When I give you this new commandment, I do not place any new burden upon your souls; rather do I bring you new joy and make it possible for you to experience new pleasure in knowing the delights of the bestowal of your heart's affection upon your fellow men. I am about to experience the supreme joy, even though enduring outward sorrow, in the bestowal of my affection upon you and your fellow mortals. 180:1.3 "When I invite you to love one another, even as I have loved you, I hold up before you the supreme measure of true affection, for greater love can no man have than this: that he will lay down his life for his friends. And you are my friends; you will continue to be my friends if you are but willing to do what I have taught you. You have called me Master, but I do not call you servants. If you will only love one another as I am loving you, you shall be my friends, and I will ever speak to you of that which the Father reveals to me. 180:1.4 "You have not merely chosen me, but I have also chosen you, and I have ordained you to go forth into the world to yield the fruit of loving service to your fellows even as I have lived among you and revealed the Father to you. The Father and I will both work with you, and you shall experience the divine fullness of joy if you will only obey my command to love one another, even as I have loved you." 180:1.5 If you would share the Master's joy, you must share his love. And to share his love means that you have shared his service. Such an experience of love does not deliver you from the difficulties of this world; it does not create a new world, but it most certainly does make the old world new. 180:2.1 Then Jesus stood up again and continued teaching his apostles : "I am the true vine, and my Father is the husbandman. I am the vine, and you are the branches. And the Father requires of me only that you shall bear much fruit. The vine is pruned only to increase the fruitfulness of its branches. Every branch coming out of me which bears no fruit, the Father will take away. Every branch which bears fruit, the Father will cleanse that it may bear more fruit. Already are you clean through the word I have spoken, but you must continue to be clean. You must abide in me, and I in you; the branch will die if it is separated from the vine. As the branch cannot bear fruit except it abides in the vine, so neither can you yield the fruits of loving service except you abide in me. Remember: I am the real vine, and you are the living branches. He who lives in me, and I in him, will bear much fruit of the spirit and experience the supreme joy of yielding this spiritual harvest. If you will maintain this living spiritual connection with me, you will bear abundant fruit. If you abide in me and my words live in you, you will be able to commune freely with me, and then can my living spirit so infuse you that you may ask whatsoever my spirit wills and do all this with the assurance that the Father will grant us our petition. Herein is the Father glorified: that the vine has many living branches, and that every branch bears much fruit. And when the world sees these fruit-bearing branches—my friends who love one another, even as I have loved them—all men will know that you are truly my disciples. 180:2.2 "As the Father has loved me, so have I loved you. Live in my love even as I live in the Father's love. If you do as I have taught you, you shall abide in my love even as I have kept the Father's word and evermore abide in his love." 180:2.3 The Jews had long taught that the Messiah would be "a stem arising out of the vine" of David's ancestors, and in commemoration of this olden teaching a large emblem of the grape and its attached vine decorated the entrance to Herod's temple. The apostles all recalled these things while the Master talked to them this night in the upper chamber. 180:2.6 And when the Father's hand of discipline is laid upon the vine, it is done in love, in order that the branches may bear much fruit. And a wise husbandman cuts away only the dead and fruitless branches. 180:2.7 Jesus had great difficulty in leading even his apostles to recognize that prayer is a function of spirit-born believers in the spirit- dominated kingdom. 180:3.1 The eleven had scarcely ceased their discussions of the discourse on the vine and the branches when the Master, indicating that he was desirous of speaking to them further and knowing that his time was short, said: "When I have left you, be not discouraged by the enmity of the world. Be not downcast even when fainthearted believers turn against you and join hands with the enemies of the kingdom. If the world shall hate you, you should recall that it hated me even before it hated you. If you were of this world, then would the world love its own, but because you are not, the world refuses to love you. You are in this world, but your lives are not to be worldlike. I have chosen you out of the world to represent the spirit of another world even to this world from which you have been chosen. But always remember the words I have spoken to you: The servant is not greater than his master. If they dare to persecute me, they will also persecute you. If my words offend the unbelievers, so also will your words offend the ungodly. And all of this will they do to you because they believe not in me nor in Him who sent me; so will you suffer many things for the sake of my gospel. But when you endure these tribulations, you should recall that I also suffered before you for the sake of this gospel of the heavenly kingdom. 180:3.2 "Many of those who will assail you are ignorant of the light of heaven, but this is not true of some who now persecute us. If we had not taught them the truth, they might do many strange things without falling under condemnation, but now, since they have known the light and presumed to reject it, they have no excuse for their attitude. He who hates me hates my Father. It cannot be otherwise; the light which would save you if accepted can only condemn you if it is knowingly rejected. And what have I done to these men that they should hate me with such a terrible hatred? Nothing, save to offer them fellowship on earth and salvation in heaven. But have you not read in the Scriptures the saying: `And they hated me without a cause'? 180:3.3 "But I will not leave you alone in the world. Very soon, after I have gone, I will send you a spirit helper. You shall have with you one who will take my place among you, one who will continue to teach you the way of truth, who will even comfort you. 180:3.4 "Let not your hearts be troubled. You believe in God; continue to believe also in me. Even though I must leave you, I will not be far from you. I have already told you that in my Father's universe there are many tarrying-places. If this were not true, I would not have repeatedly told you about them. I am going to return to these worlds of light, stations in the Father's heaven to which you shall sometime ascend. From these places I came into this world, and the hour is now at hand when I must return to my Father's work in the spheres on high. 180:3.5 "If I thus go before you into the Father's heavenly kingdom, so will I surely send for you that you may be with me in the places that were prepared for the mortal sons of God before this world was. Even though I must leave you, I will be present with you in spirit, and eventually you shall be with me in person when you have ascended to me in my universe even as I am about to ascend to my Father in his greater universe. And what I have told you is true and everlasting, even though you may not fully comprehend it. I go to the Father, and though you cannot now follow me, you shall certainly follow me in the ages to come." 180:3.6 When Jesus sat down, Thomas arose and said: "Master, we do not know where you are going; so of course we do not know the way. But we will follow you this very night if you will show us the way." 180:3.7 When Jesus heard Thomas, he answered: "Thomas, I am the way, the truth, and the life. No man goes to the Father except through me. All who find the Father, first find me. If you know me, you know the way to the Father. And you do know me, for you have lived with me and you now see me." 180:3.8 But this teaching was too deep for many of the apostles, especially for Philip, who, after speaking a few words with Nathaniel, arose and said: "Master, show us the Father, and everything you have said will be made plain." 180:3.9 And when Philip had spoken, Jesus said: "Philip, have I been so long with you and yet you do not even now know me? Again do I declare: He who has seen me has seen the Father. How can you then say, Show us the Father? Do you not believe that I am in the Father and the Father in me? Have I not taught you that the words which I speak are not my words but the words of the Father? I speak for the Father and not of myself. I am in this world to do the Father's will, and that I have done. My Father abides in me and works through me. Believe me when I say that the Father is in me, and that I am in the Father, or else believe me for the sake of the very life I have lived—for the work's sake." 180:4.1 Jesus continued to teach, saying: "When I have gone to the Father, and after he has fully accepted the work I have done for you on earth, and after I have received the final sovereignty of my own domain, I shall say to my Father: Having left my children alone on earth, it is in accordance with my promise to send them another teacher. And when the Father shall approve, I will pour out the Spirit of Truth upon all flesh. Already is my Father's spirit in your hearts, and when this day shall come, you will also have me with you even as you now have the Father. This new gift is the spirit of living truth. The unbelievers will not at first listen to the teachings of this spirit, but the sons of light will all receive him gladly and with a whole heart. And you shall know this spirit when he comes even as you have known me, and you will receive this gift in your hearts, and he will abide with you. You thus perceive that I am not going to leave you without help and guidance. I will not leave you desolate. Today I can be with you only in person. In the times to come I will be with you and all other men who desire my presence, wherever you may be, and with each of you at the same time. Do you not discern that it is better for me to go away; that I leave you in the flesh so that I may the better and the more fully be with you in the spirit? 180:4.2 "In just a few hours the world will see me no more; but you will continue to know me in your hearts even until I send you this new teacher, the Spirit of Truth. As I have lived with you in person, then shall I live in you; I shall be one with your personal experience in the spirit kingdom. And when this has come to pass, you shall surely know that I am in the Father, and that, while your life is hid with the Father in me, I am also in you. I have loved the Father and have kept his word; you have loved me, and you will keep my word. As my Father has given me of his spirit, so will I give you of my spirit. And this Spirit of Truth which I will bestow upon you shall guide and comfort you and shall eventually lead you into all truth. 180:4.3 "I am telling you these things while I am still with you that you may be the better prepared to endure those trials which are even now right upon us. And when this new day comes, you will be indwelt by the Son as well as by the Father. And these gifts of heaven will ever work the one with the other even as the Father and I have wrought on earth and before your very eyes as one person, the Son of Man. And this spirit friend will bring to your remembrance everything I have taught you." 180:4.4 As the Master paused for a moment, Judas Alpheus made bold to ask one of the few questions which either he or his brother ever addressed to Jesus in public. Said Judas: "Master, you have always lived among us as a friend; how shall we know you when you no longer manifest yourself to us save by this spirit? If the world sees you not, how shall we be certain about you? How will you show yourself to us?" 180:4.5 Jesus looked down upon them all, smiled, and said: "My little children, I am going away, going back to my Father. In a little while you will not see me as you do here, as flesh and blood. In a very short time I am going to send you my spirit, just like me except for this material body. This new teacher is the Spirit of Truth who will live with each one of you, in your hearts, and so will all the children of light be made one and be drawn toward one another. And in this very manner will my Father and I be able to live in the souls of each one of you and also in the hearts of all other men who love us and make that love real in their experiences by loving one another, even as I am now loving you." 180:4.6 Judas Alpheus did not fully understand what the Master said, but he grasped the promise of the new teacher, and from the expression on Andrew's face, he perceived that his question had been satisfactorily answered. 180:5.7 In the kingdom of the believing brotherhood of God- knowing truth lovers, this golden rule takes on living qualities of spiritual realization on those higher levels of interpretation which cause the mortal sons of God to view this injunction of the Master as requiring them so to relate themselves to their fellows that they will receive the highest possible good as a result of the believer's contact with them. This is the essence of true religion: that you love your neighbor as yourself. 180:6.1 After Peter, James, John, and Matthew had asked the Master numerous questions, he continued his farewell discourse by saying: "And I am telling you about all this before I leave you in order that you may be so prepared for what is coming upon you that you will not stumble into serious error. The authorities will not be content with merely putting you out of the synagogues; I warn you the hour draws near when they who kill you will think they are doing a service to God. And all of these things they will do to you and to those whom you lead into the kingdom of heaven because they do not know the Father. They have refused to know the Father by refusing to receive me; and they refuse to receive me when they reject you, provided you have kept my new commandment that you love one another even as I have loved you. I am telling you in advance about these things so that, when your hour comes, as mine now has, you may be strengthened in the knowledge that all was known to me, and that my spirit shall be with you in all your sufferings for my sake and the gospel's. It was for this purpose that I have been talking so plainly to you from the very beginning. I have even warned you that a man's foes may be those of his own household. Although this gospel of the kingdom never fails to bring great peace to the soul of the individual believer, it will not bring peace on earth until man is willing to believe my teaching wholeheartedly and to establish the practice of doing the Father's will as the chief purpose in living the mortal life. 180:6.2 "Now that I am leaving you, seeing that the hour has come when I am about to go to the Father, I am surprised that none of you have asked me, Why do you leave us? Nevertheless, I know that you ask such questions in your hearts. I will speak to you plainly, as one friend to another. It is really profitable for you that I go away. If I go not away, the new teacher cannot come into your hearts. I must be divested of this mortal body and be restored to my place on high before I can send this spirit teacher to live in your souls and lead your spirits into the truth. And when my spirit comes to indwell you, he will illuminate the difference between sin and righteousness and will enable you to judge wisely in your hearts concerning them. 180:6.3 "I have yet much to say to you, but you cannot stand any more just now. Albeit, when he, the Spirit of Truth, comes, he shall eventually guide you into all truth as you pass through the many abodes in my Father's universe. 180:6.4 "This spirit will not speak of himself, but he will declare to you that which the Father has revealed to the Son, and he will even show you things to come; he will glorify me even as I have glorified my Father. This spirit comes forth from me, and he will reveal my truth to you. Everything which the Father has in this domain is now mine; wherefore did I say that this new teacher would take of that which is mine and reveal it to you. 180:6.5 "In just a little while I will leave you for a short time. Afterward, when you again see me, I shall already be on my way to the Father so that even then you will not see me for long." 180:6.6 While he paused for a moment, the apostles began to talk with each other: "What is this that he tells us? `In just a little while I will leave you,' and `When you see me again it will not be for long, for I will be on my way to the Father.' What can he mean by this `little while' and `not for long'? We cannot understand what he is telling us." 180:6.7 And since Jesus knew they asked these questions, he said: "Do you inquire among yourselves about what I meant when I said that in a little while I would not be with you, and that, when you would see me again, I would be on my way to the Father? I have plainly told you that the Son of Man must die, but that he will rise again. Can you not then discern the meaning of my words? You will first be made sorrowful, but later on will you rejoice with many who will understand these things after they have come to pass. A woman is indeed sorrowful in the hour of her travail, but when she is once delivered of her child, she immediately forgets her anguish in the joy of the knowledge that a man has been born into the world. And so are you about to sorrow over my departure, but I will soon see you again, and then will your sorrow be turned into rejoicing, and there shall come to you a new revelation of the salvation of God which no man can ever take away from you. And all the worlds will be blessed in this same revelation of life in effecting the overthrow of death. Hitherto have you made all your requests in my Father's name. After you see me again, you may also ask in my name, and I will hear you. 180:6.8 "Down here I have taught you in proverbs and spoken to you in parables. I did so because you were only children in the spirit; but the time is coming when I will talk to you plainly concerning the Father and his kingdom. And I shall do this because the Father himself loves you and desires to be more fully revealed to you. Mortal man cannot see the spirit Father; therefore have I come into the world to show the Father to your creature eyes. But when you have become perfected in spirit growth, you shall then see the Father himself." 180:6.9 When the eleven had heard him speak, they said to each other: "Behold, he does speak plainly to us. Surely the Master did come forth from God. But why does he say he must return to the Father?" And Jesus saw that they did not even yet comprehend him. 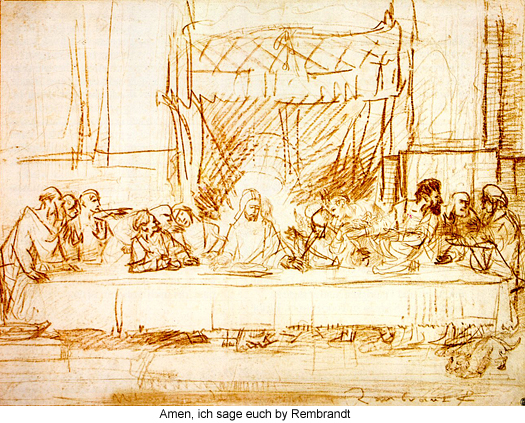 These eleven men could not get away from their long-nourished ideas of the Jewish concept of the Messiah. The more fully they believed in Jesus as the Messiah, the more troublesome became these deep-rooted notions regarding the glorious material triumph of the kingdom on earth. 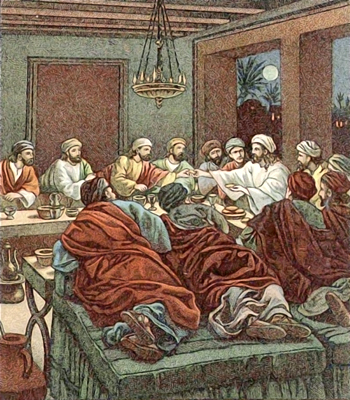 AFTER THE CONCLUSION of the farewell discourse to the eleven, Jesus visited informally with them and recounted many experiences which concerned them as a group and as individuals. At last it was beginning to dawn upon these Galileans that their friend and teacher was going to leave them, and their hope grasped at the promise that, after a little while, he would again be with them, but they were prone to forget that this return visit was also for a little while. Many of the apostles and the leading disciples really thought that this promise to return for a short season (the short interval between the resurrection and the ascension) indicated that Jesus was just going away for a brief visit with his Father, after which he would return to establish the kingdom. And such an interpretation of his teaching conformed both with their preconceived beliefs and with their ardent hopes. Since their lifelong beliefs and hopes of wish fulfillment were thus agreed, it was not difficult for them to find an interpretation of the Master's words which would justify their intense longings. 181:2.5 As John Zebedee stood there in the upper chamber, the tears rolling down his cheeks, he looked into the Master's face and said: "And so I will, my Master, but how can I learn to love my brethren more?" And then answered Jesus: "You will learn to love your brethren more when you first learn to love their Father in heaven more, and after you have become truly more interested in their welfare in time and in eternity. And all such human interest is fostered by understanding sympathy, unselfish service, and unstinted forgiveness. No man should despise your youth, but I exhort you always to give due consideration to the fact that age oftentimes represents experience, and that nothing in human affairs can take the place of actual experience. Strive to live peace ably with all men, especially your friends in the brotherhood of the heavenly kingdom. And, John, always remember, strive not with the souls you would win for the kingdom." 181:2.11 "And now, Simon, when you do finally see all of this, and after you have shaken off your depression and have gone forth proclaiming this gospel in great power, never forget that I was with you even through all of your season of discouragement, and that I will go on with you to the very end. You shall always be my apostle, and after you become willing to see by the eye of the spirit and more fully to yield your will to the will of the Father in heaven, then will you return to labor as my ambassador, and no one shall take away from you the authority which I have conferred upon you, because of your slowness of comprehending the truths I have taught you. And so, Simon, once more I warn you that they who fight with the sword perish with the sword, while they who labor in the spirit achieve life everlasting in the kingdom to come with joy and peace in the kingdom which now is. And when the work given into your hands is finished on earth, you, Simon, shall sit down with me in my kingdom over there. You shall really see the kingdom you have longed for, but not in this life. Continue to believe in me and in that which I have revealed to you, and you shall receive the gift of eternal life. " 181:2.20 And then Jesus went over to Philip, who, standing up, heard this message from his Master: "Philip, you have asked me many foolish questions, but I have done my utmost to answer every one, and now would I answer the last of such questionings which have arisen in your most honest but unspiritual mind. All the time I have been coming around toward you, have you been saying to yourself, `What shall I ever do if the Master goes away and leaves us alone in the world?' O, you of little faith! And yet you have almost as much as many of your brethren. You have been a good steward, Philip. You failed us only a few times, and one of those failures we utilized to manifest the Father's glory. Your office of stewardship is about over. You must soon more fully do the work you were called to do—the preaching of this gospel of the kingdom. Philip, you have always wanted to be shown, and very soon shall you see great things. Far better that you should have seen all this by faith, but since you were sincere even in your material sightedness, you will live to see my words fulfilled. And then, when you are blessed with spiritual vision, go forth to your work, dedicating your life to the cause of leading mankind to search for God and to seek eternal realities with the eye of spiritual faith and not with the eyes of the material mind. Remember, Philip, you have a great mission on earth, for the world is filled with those who look at life just as you have tended to. You have a great work to do, and when it is finished in faith, you shall come to me in my kingdom, and I will take great pleasure in showing you that which eye has not seen, ear heard, nor the mortal mind conceived. In the meantime, become as a little child in the kingdom of the spirit and permit me, as the spirit of the new teacher, to lead you forward in the spiritual kingdom. And in this way will I be able to do much for you which I was not able to accomplish when I sojourned with you as a mortal of the realm. And always remember, Philip, he who has seen me has seen the Father." 181:2.22 "If you would learn to work with your brethren, you might accomplish more permanent things, but if you find yourself going off in quest of those who think as you do, in that event dedicate your life to proving that the God- knowing disciple can become a kingdom builder even when alone in the world and wholly isolated from his fellow believers. I know you will be faithful to the end, and I will some day welcome you to the enlarged service of my kingdom on high." 181:2.24 "I have taught you much by word of mouth, and I have lived my life among you. I have done all that can be done to enlighten your minds and liberate your souls, and what you have not been able to get from my teachings and my life, you must now prepare to acquire at the hand of that master of all teachers— actual experience. And in all of this new experience which now awaits you, I will go before you and the Spirit of Truth shall be with you. Fear not; that which you now fail to comprehend, the new teacher, when he has come, will reveal to you throughout the remainder of your life on earth and on through your training in the eternal ages." 181:2.27 Then the Master went over to Simon Peter, who stood up as Jesus addressed him: "Peter, I know you love me, and that you will dedicate your life to the public proclamation of this gospel of the kingdom to Jew and gentile, but I am distressed that your year s of such close association with me have not done more to help you think before you speak. What experience must you pass through before you will learn to set a guard upon your lips? How much trouble have you made for us by your thoughtless speaking, by your presumptuous self-confidence! And you are destined to make much more trouble for yourself if you do not master this frailty. You know that your brethren love you in spite of this weakness, and you should also understand that this shortcoming in no way impairs my affection for you, but it lessens your usefulness and never ceases to make trouble for you. But you will undoubtedly receive great help from the experience you will pass through this very night. And what I now say to you, Simon Peter, I likewise say to all your brethren here assembled: This night you will all be in great danger of stumbling over me. You know it is written, `The shepherd will be smitten and the sheep will be scattered abroad.' When I am absent, there is great danger that some of you will succumb to doubts and stumble because of what befalls me. But I promise you now that I will come back to you for a little while, and that I will then go before you into Galilee."